Deborah Hardoon, Oxfam’s Deputy Head of Research, kicks off a new series of book reviews for those who want to delve deeper into development and humanitarian issues, beginning with Africa: Why Economists Get It Wrong by Morten Jerven. The title provoked me. With a Masters degree in the subject, I include myself in the broad sense of being an ‘economist’. Where I am wrong, I need to know about it and in a world where we need to seriously worry about being consumed in our own echo chambers, there is a need to consciously choose to listen to opposing views. I have learnt a great deal from being challenged. Recognising and responding to critics has been an important and valuable part of my job at Oxfam, as our research continues to challenge the position, interests and perspectives held by others. I am naturally attracted to a book that seeks to challenge me. Of course there is a lot you read that rubbishes the theoretical foundations and guiding principles of economics in its current dominant form and demands a new way of thinking about the way our economies and societies work. I have done so myself in our recent report. But on balance, I also think that these theoretical foundations can help us to understand how things work and what can be done to make life better when they are tested – through empirical analysis based on real world data. But this book challenges the numbers. The stuff we use as evidence, as indisputable facts, the stuff we pick out of spreadsheets and trust. As a researcher I have dealt first hand with the challenges of getting measurement right, I know that no number is irrefutable. My research is also for the primary purpose of affecting positive change – and I know how powerful numbers can be in that respect. So this book flew off the shelf (or at least the virtual online shelf) as essential reading to help me understand some of the data issues specific to the African context and which I may have overlooked. Having read the Bottom Billion did you see Africa surrounded by poverty traps, or did you get that ‘aha!’ moment having read Why Nations Fail? This book questions these and other widely held views, assumptions and stylised facts and by walking you through the data and arguments presented, empowers you to do the same. Jerven writes: “this book invites readers to question the evidence, to interrogate the assumptions and judge for themselves”. In reference to the World Bank and IMF, Jerven says in the introduction “economists’ mistakes spill over into the policy world” and “non-economist audiences are often persuaded by the rhetorical power of economists”. This book ask us to think about how African economies work, and to take a nuanced political economy analysis of who they are working for, rather than seeking a causal variable which explains why they don’t. The continent is diverse and its economic record post independence is varied, it is not a simple case of failed growth (1970’s – 1990’s), summarised by the African dummy variable or ‘institutions’. Economists that work with cross country regressions to explain the world use aggregate growth rates or income levels for different countries and try to explain with other variables why African growth rates are generally slower and income levels consistently lower. This is inappropriate when there is no consistency and the growth story can’t and shouldn’t be generalised. Jerven presents some data which lets us see the growth story year on year, country by country and GDP as a whole and per capita. To conclude “African economies have displayed both growth and decline; they have not been trapped in a low level equilibrium where poverty has reproduced itself”. 2. More compelling evidence that GDP is a deeply flawed statistic. Plenty has been written about the problems with GDP as a measure in and of itself, Jerven tells us (based on research for his previous book, ‘Poor numbers’) that 24 out of 34 countries were measuring GDP based on measuring the structure of their economies (the benchmark year) more than a decade ago. When Nigeria and Ghana updated their benchmark year, their GDP numbers dramatically increased. How do we explain that increase in income? To discuss why ‘correlation is not causal’ Jerven used a great illustration, which has been statistically tested. Before electric lights, during the dark winter months and post harvest time in Europe, people spent more time indoors keeping warm. Nine months later, as Spring arrived, Storks flew into sunny Europe and so did lots of babies, hence the association. There is some academic literature on this phenomenon. The book really labours on GDP growth, he explains on page 78 why he has taken on this narrow focus, but the few references to the distribution of growth or limitations of GDP become really annoying because they are not developed and it’s still essentially a critical analysis of GDP growth patterns and the underlying data. Perhaps it is because I am suffering from anti GDP fatigue, and already know that it shouldn’t be given too much emphasis either in academic or policy circles, but I would have liked more analysis on the other variables that do have more relevance for people living in poverty – beyond summarising that “the relationship between economic growth, inequality and poverty is sometimes analysed with sophisticated models, but most of the time the quality of the data does not warrant the level of statistical conjectures made”. But perhaps that’s for his next book. Should we invest in the statistical capacity of governments? Should we be re-training all economists? Should we embed economists in the societies in which they are studying or leave it to the ethnographers? What should we be doing to understand African economies better? I have been working in research for advocacy for five years now, so my default is to end any paper with a recommendations section, so I guess I have been trained to think about the implications of any findings. With this book I am left confused as to what to take forward. I myself will continue to scrutinise macro data and statistics to understand economic development. Should we invest in the statistical capacity of governments? Should we be re-training all economists? Should we embed economists in the societies in which they are studying or leave it to the ethnographers? There are some mixed messages on this in the book. If you have studied economics, or read some of the best sellers on economic development, you’ll probably like the summaries presented of these familiar arguments and then appreciate how Jerven unpacks them. If you are a numbers person, you’ll probably enjoy the charts and tables which break up the narrative and illustrate his points well. He makes it clear why reading this book is important, by setting out how statistics and economic analysis have been central to inform policies. This is obviously massively problematic when the numbers and analysis are flawed in the first place. By the end however – of a relatively short book – I was finding the tone and messages unnecessarily aggressive, cynical and unconstructive. 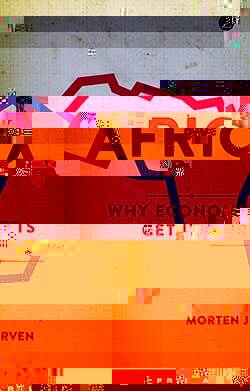 For someone who complains about generalisations, his conclusion generalises that “economists studying growth in Africa are destined to fail”. It reads like a public take down of some really respected economists, but then left me hanging when it came to understanding how to do better – to understand the stuff that I think really matters and how to take these insights forward.